For those who have forgotten and have a veneer obscuring their view, corruption had its own local terminology, Kalabule. In 1982 at the advent of the revolution, Ghanaians had to queue for essential commodities such as bread and maize in order to make ends meet. This did not break down the resolve of the people. The young and able-bodied ones, mostly drawn from the universities travelled to the hinterlands to help cart cocoa onto trucks and trains to the ports for export. The desire to die for mother Ghana was the driving force behind the revolution. It was a re-birth of the spirit of patriotism – the love of one’s country. Ladies and gentlemen, it is important that we do not forget and indeed we cannot forget the progress this country made under the PNDC and subsequently the first NDC government that offered Ghana a great new lift off for economic development. For those who have today turned the clock of progress around and allowed kalabule to confidently walk back into the soul of the country, history has to be re-told because their arrogance and indifference has almost brought the country to its knees. Under the guise of a capitalist property-owning democracy we have gradually re-institutionalized corruption and allowed a select few to monopolise resources and by virtue of that become political kingmakers who dictate even the choice of constituency party executives. The time has come for the rhetoric to stop. The time has come for the men and women who believe in the ideals of June 4, 31st December and the NDC to rise up. The time has come for a new revolution. This is not about Jerry Rawlings. This is about you and generations to come. 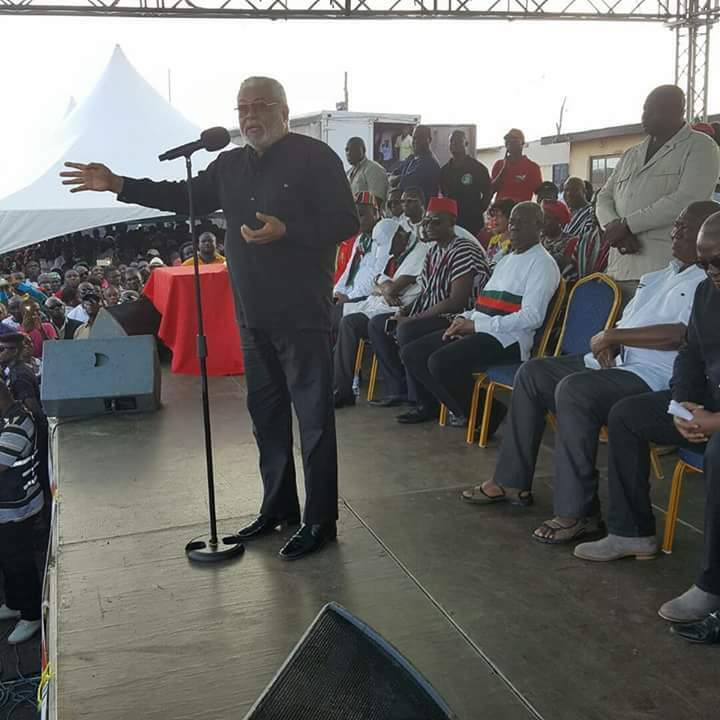 Rawlings is not a faction and will never be. The ideals you believe in and for which I stand for and represent, are ideals that will stand the test of time no matter how long some choose to distort it with transient economic might. You have to be strong, steadfast and politically robust. You have to rise up to be counted just as our dynamic women, selfless youth, workers, farmers, petty traders, comrades did for us three decades ago. Sadly we ended up disrespecting and denigrating these people who knew nothing but to offer themselves to the party and country. Let us also commend all those who have stoutly defended and protected the revolution and the party’s ideals from the beginning. Those ideals are the guiding force that will strengthen and unify the party. Let us rebuild the party around these principles and values. Thereafter those who emerge at all levels of leadership will get the collective support of all. Our grassroot democratic model should prevail and that will happen if the ordinary people of the party choose the path of sacrifice in order to save our party. Many laid down their lives to give birth to this movement. With strength of character, integrity and patriotism, we can make those martyrs proud once again.